Technological advances have driven dramatic increases in industrial productivity since the dawn of the Industrial Revolution. The steam engine powered factories in the nineteenth century, electrification led to mass production in the early part of the twentieth century, and industry became automated in the 1970s. In the decades that followed, however, industrial technological advancements were only incremental, especially compared with the breakthroughs that transformed IT, mobile communications, and e-commerce. Now, though, we are in the midst of a fourth wave of technological advancement: the rise of new digital industrial technology known as Industry 4.0, a transformation that is powered by nine foundational technology advances. (See Exhibit 1.) In this transformation, sensors, machines, workpieces, and IT systems will be connected along the value chain beyond a single enterprise. These connected systems (also referred to as cyberphysical systems) can interact with one another using standard Internet-based protocols and analyze data to predict failure, configure themselves, and adapt to changes. Industry 4.0 will make it possible to gather and analyze data across machines, enabling faster, more flexible, and more efficient processes to produce higher-quality goods at reduced costs. This in turn will increase manufacturing productivity, shift economics, foster industrial growth, and modify the profile of the workforce—ultimately changing the competitiveness of companies and regions. This report describes the nine technology trends that are the building blocks of Industry 4.0 and explores their potential technical and economic benefits for manufacturers and production equipment suppliers. To demonstrate our findings, we use case studies from Germany, which is recognized as a world leader in industrial automation. Analytics based on large data sets has emerged only recently in the manufacturing world, where it optimizes production quality, saves energy, and improves equipment service. In an Industry 4.0 context, the collection and comprehensive evaluation of data from many different sources—production equipment and systems as well as enterprise- and customer-management systems—will become standard to support real-time decision making. For instance, semiconductor manufacturer Infineon Technologies has decreased product failures by correlating single-chip data captured in the testing phase at the end of the production process with process data collected in the wafer status phase earlier in the process. In this way, Infineon can identify patterns that help discharge faulty chips early in the production process and improve production quality. Manufacturers in many industries have long used robots to tackle complex assignments, but robots are evolving for even greater utility. They are becoming more autonomous, flexible, and cooperative. Eventually, they will interact with one another and work safely side by side with humans and learn from them. These robots will cost less and have a greater range of capabilities than those used in manufacturing today. For example, Kuka, a European manufacturer of robotic equipment, offers autonomous robots that interact with one another. These robots are interconnected so that they can work together and automatically adjust their actions to fit the next unfinished product in line. High-end sensors and control units enable close collaboration with humans. Similarly, industrial-robot supplier ABB is launching a two-armed robot called YuMi that is specifically designed to assemble products (such as consumer electronics) alongside humans. Two padded arms and computer vision allow for safe interaction and parts recognition. In the engineering phase, 3-D simulations of products, materials, and production processes are already used, but in the future, simulations will be used more extensively in plant operations as well. These simulations will leverage real-time data to mirror the physical world in a virtual model, which can include machines, products, and humans. This allows operators to test and optimize the machine settings for the next product in line in the virtual world before the physical changeover, thereby driving down machine setup times and increasing quality. For example, Siemens and a German machine-tool vendor developed a virtual machine that can simulate the machining of parts using data from the physical machine. This lowers the setup time for the actual machining process by as much as 80 percent. Most of today’s IT systems are not fully integrated. Companies, suppliers, and customers are rarely closely linked. Nor are departments such as engineering, production, and service. Functions from the enterprise to the shop floor level are not fully integrated. Even engineering itself—from products to plants to automation—lacks complete integration. But with Industry 4.0, companies, departments, functions, and capabilities will become much more cohesive, as cross-company, universal data-integration networks evolve and enable truly automated value chains. For instance, Dassault Systèmes and BoostAeroSpace launched a collaboration platform for the European aerospace and defense industry. The platform, AirDesign, serves as a common workspace for design and manufacturing collaboration and is available as a service on a private cloud. It manages the complex task of exchanging product and production data among multiple partners. Today, only some of a manufacturer’s sensors and machines are networked and make use of embedded computing. They are typically organized in a vertical automation pyramid in which sensors and field devices with limited intelligence and automation controllers feed into an overarching manufacturing-process control system. But with the Industrial Internet of Things, more devices—sometimes including even unfinished products—will be enriched with embedded computing and connected using standard technologies. This allows field devices to communicate and interact both with one another and with more centralized controllers, as necessary. It also decentralizes analytics and decision making, enabling real-time responses. Bosch Rexroth, a drive-and-control-system vendor, outfitted a production facility for valves with a semiautomated, decentralized production process. Products are identified by radio frequency identification codes, and workstations “know” which manufacturing steps must be performed for each product and can adapt to perform the specific operation. Many companies still rely on management and production systems that are unconnected or closed. With the increased connectivity and use of standard communications protocols that come with Industry 4.0, the need to protect critical industrial systems and manufacturing lines from cybersecurity threats increases dramatically. As a result, secure, reliable communications as well as sophisticated identity and access management of machines and users are essential. During the past year, several industrial-equipment vendors have joined forces with cybersecurity companies through partnerships or acquisitions. Companies are already using cloud-based software for some enterprise and analytics applications, but with Industry 4.0, more production-related undertakings will require increased data sharing across sites and company boundaries. At the same time, the performance of cloud technologies will improve, achieving reaction times of just several milliseconds. As a result, machine data and functionality will increasingly be deployed to the cloud, enabling more data-driven services for production systems. Even systems that monitor and control processes may become cloud based. Vendors of manufacturing-execution systems are among the companies that have started to offer cloud-based solutions. Companies have just begun to adopt additive manufacturing, such as 3-D printing, which they use mostly to prototype and produce individual components. With Industry 4.0, these additive-manufacturing methods will be widely used to produce small batches of customized products that offer construction advantages, such as complex, lightweight designs. High-performance, decentralized additive manufacturing systems will reduce transport distances and stock on hand. For instance, aerospace companies are already using additive manufacturing to apply new designs that reduce aircraft weight, lowering their expenses for raw materials such as titanium. For example, workers may receive repair instructions on how to replace a particular part as they are looking at the actual system needing repair. This information may be displayed directly in workers’ field of sight using devices such as augmented-reality glasses. Another application is virtual training. Siemens has developed a virtual plant-operator training module for its Comos software that uses a realistic, data-based 3-D environment with augmented-reality glasses to train plant personnel to handle emergencies. In this virtual world, operators can learn to interact with machines by clicking on a cyberrepresentation. They also can change parameters and retrieve operational data and maintenance instructions. The race to adopt elements of Industry 4.0 is already under way among companies in Europe, the U.S., and Asia. Revenue Growth. Industry 4.0 will also drive revenue growth. Manufacturers’ demand for enhanced equipment and new data applications, as well as consumer demand for a wider variety of increasingly customized products, will drive additional revenue growth of about €30 billion a year, or roughly 1 percent of Germany’s GDP. Employment. In our analysis of Industry 4.0’s impact on German manufacturing, we found that the growth it stimulates will lead to a 6 percent increase in employment during the next ten years. (See Exhibit 4.) And demand for employees in the mechanical-engineering sector may rise even more—by as much as 10 percent during the same period. However, different skills will be required. In the short term, the trend toward greater automation will displace some of the often low-skilled laborers who perform simple, repetitive tasks. At the same time, the growing use of software, connectivity, and analytics will increase the demand for employees with competencies in software development and IT technologies, such as mechatronics experts with software skills. (Mechatronics is a field of engineering that comprises multiple engineering disciplines.) This competency transformation is one of the key challenges ahead. Investment. Adapting production processes to incorporate Industry 4.0 will require that German producers invest about €250 billion during the next ten years (about 1 to 1.5 percent of manufacturers’ revenues), we estimate. The estimated benefits in Germany illustrate the potential impact of Industry 4.0 for manufacturing globally. Industry 4.0 will have a direct effect on producers and their labor force as well as on companies that supply manufacturing systems. Along the value chain, production processes will be optimized through integrated IT systems. As a result, today’s insular manufacturing cells will be replaced by fully automated, integrated production lines. Using a component maker as an example, we illustrate how Industry 4.0 will transform the manufacturing process over the next 10 to 20 years. The transformation begins with the integration of production and logistics processes and their corresponding IT systems. This includes the exchange of product and production data inside the company as well as with customers and suppliers. Suppliers, in particular, will benefit from the exchange of design and supply-chain data. Communication across the production process will be (near) real time among humans, machines, parts, and products. Systems that today are proprietary will evolve into both meshed and hierarchical networks with standardized, open interfaces. Data will be stored in the cloud to increase its availability and accuracy. This will enable more flexibility when reacting to changes (both expected and unexpected) in the production process. Every part being produced will receive a distinct identification code or even a small embedded microcomputer from which autonomous robots will retrieve information dictating the next production steps. These instructions will be more “objective” than today’s task-centered ones. For example, the robot will get the directive to drill a hole at a certain location, select the right tool, and determine how to fulfill this objective rather than getting precise instructions for turning its different robot-arm segments. In pursuing its more objective directive, it might interact with other robots to coordinate their respective arm movements so as to maximize overall production. It might also work side by side with humans. This enhanced cooperation among machines and humans will make it possible for component manufacturers to produce multiple component types from one production line in smaller lot sizes, where beneficial. Product quality will improve through the reduction of manual labor and the increased use of real-time data to spot errors. Automation will also increase the efficiency of logistics on the factory floor. Autonomous transport vehicles will work with consignment robots to adjust in-bound materials on the basis of real-time operations data. These vehicles will be able to find their way around the factory floor using laser navigation and communicate with other vehicles using wireless networks. Consignment robots will automatically find and select the proper materials for upcoming production processes. Other estimated cost reductions include 30 percent for labor, operating costs, and overhead over five to ten years. Not only will integrated production and logistics processes be more cost efficient, they will reduce cycle times by as much as 30 percent. Adopting these technologies will require an investment increase of about 35 percent. In the automobile industry, small-batch capabilities will allow for more versatility in welding, seam sealing, and assembly using cooperative, autonomous robots. For example, fixed clamping devices currently used in the welding process will develop into adaptive industrial robots that can hold and spin each piece according to the individual requirements of the welding robots. As a result, companies will be able to produce multiple car models with different body styles and designs using one flexible production line. Product and plant engineering can be expanded to multiple product life cycles and models. In the future, the car-making process will be overseen by automatic job-control systems. These will use data integration to modify the manufacturing process automatically, making multiple order systems obsolete. Car component suppliers will automatically adjust their processes on the basis of new orders from the automaker, maximizing just-in-time logistics. This change will reduce the costs of logistics and operations. Although robots will be more autonomous in the car factory of the future, employees will continue to play a role. Human workers will be equipped with augmented-reality glasses that can put logistics and manufacturing information in their field of vision. The glasses will use virtual reality to highlight the location where each part should be mounted in the assembly process. Similarly, data glasses will guide consignment employees in selecting the proper parts. Gesture-recognizing cameras will assist workers in performing quality control checks by automatically documenting and storing quality issues, reducing manual paperwork. These advances will enable auto workers to handle a wider variety of car models while reducing failure rates and enhancing quality control. During the lifetime of the car, its virtual model, created in the engineering phase and integrating all relevant data, will constantly be updated with performance data and data from exchanged parts. Using this virtual model, sometimes called the “digital twin,” producers can improve their after-sales service, offer a range of new services, and generate insights that can be used to optimize the design of future cars. We estimate that in the next five to ten years, these types of changes will generate €25 billion to €38 billion overall in productivity increases for the German automotive industry, or productivity gains of 6 to 9 percent compared with total costs. Manufacturing processes will be enhanced through learning and self-optimizing pieces of equipment that will, for example, adjust their own parameters as they sense certain properties of the unfinished product. Automated logistics, using autonomous vehicles and robots, will adjust automatically to production needs. Industry 4.0 allows for a faster response to customer needs than is possible today. It improves the flexibility, speed, productivity, and quality of the production process. And it lays the foundation for the adoption of new business models, production processes, and other innovations. This will enable a new level of mass customization as more industrial producers invest in Industry 4.0 technologies to enhance and customize their offerings. As manufacturers demand the greater connectivity and interaction of Industry 4.0–capable machines and systems in their factories, manufacturing-system suppliers will have to expand the role of IT in their products. Changes will likely include a greater modularization of functionality with deployments in the cloud and on embedded devices. With increases in the overall functionality and complexity of systems comes the need for a greater distribution of decision making. In addition, online portals for downloading software and collaborative partner relationships may offer more flexible and adaptable equipment configurations. Automation architectures will also evolve for different use cases. Suppliers will have to prepare for these various scenarios and support these shifts. Industrial-automation vendors and most machine-tool manufacturers have built significant software-development capabilities—but Industry 4.0 will require even more. In addition, these vendors will have to compete with IT players that are moving into the growing market for shop-floor- and production-related applications and data-driven services. The growing interconnectivity of machines, products, parts, and humans will also require new international standards that define the interaction of these elements in the digital factory of the future. Efforts to develop these standards are in their infancy but are being driven by traditional standardization bodies and emerging consortia. Germany’s Plattform Industrie 4.0 was the first driver, but the U.S.-based Industrial Internet Consortium (IIC)—founded in March 2014 by manufacturing, Internet, IT, and telecommunications companies—has become a prominent alternative. Subsequently, a new body, the Dialogplattform Industrie 4.0, was formed in Germany to counteract the IIC’s strong position. Several other standardization organizations have ambitions in the field. Strategically choosing participation in these and other bodies and actively shaping the standardization agenda will be critical for manufacturing-system suppliers. Industries and countries will embrace Industry 4.0 at different rates and in different ways. Industries with a high level of product variants, such as the automotive and food-and-beverage industries, will benefit from a greater degree of flexibility that can generate productivity gains, for example, and industries that demand high quality, such as semiconductors and pharmaceuticals, will benefit from data-analytics-driven improvements that reduce error rates. Countries with high-cost skilled labor will be able to capitalize on the higher degree of automation combined with the increased demand for more highly skilled labor. However, many emerging markets with a young, technology-savvy workforce might also jump at the opportunity and might even create entirely new manufacturing concepts. To actively shape the transformation, producers and system suppliers must take decisive action to embrace the nine pillars of technological advancement. They must also address the need to adapt the appropriate infrastructure and education. Identify key areas for improvement, such as flexibility, speed, productivity, and quality. Then, consider how the nine pillars of technological advancement can drive improvement in the designated areas. Avoid becoming stuck in incremental approaches; instead, consider more fundamental changes enabled by a combination of the nine technologies. Analyze the long-term impact on the workforce and conduct strategic workforce planning. Adapt roles, recruiting, and vocational training to prepare the workforce with the additional IT skills that will be required. While these improvements already hold significant potential for existing industries, emerging fields could use Industry 4.0 technology to disrupt existing standards using innovative factory layouts and production processes. Define which business model to leverage for their enhanced or new offers. Build the technological foundation, such as the tool base for analytics. Build the right organization structure and capabilities. Develop partnerships that are essential in the digital world. Participate in and shape technological standardization. In parallel, system suppliers need to build a scenario-based vision of the long-term industry evolution and ensure that their strategy will prepare them for the most likely scenarios. Upgrade technological infrastructure, such as fixed- and mobile-broadband services. Infrastructure must be rendered fast, secure, and reliable enough for companies to depend on it for near real-time data. Adapt school curricula, training, and university programs and strengthen entrepreneurial approaches to increase the IT-related skills and innovation abilities of the workforce. Industry 4.0 presents tremendous opportunities for innovative producers, system suppliers, and entire regions. 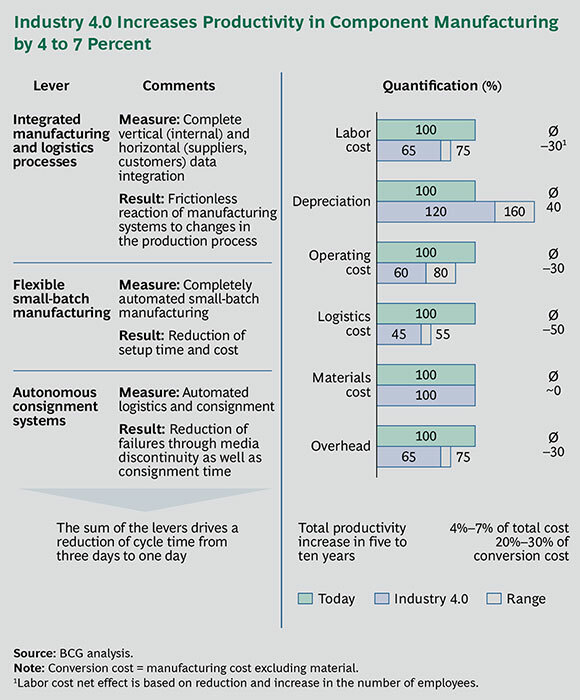 But, as with previous transformational developments, Industry 4.0 also poses a severe threat to laggards. As business models, economics, and skill requirements shift, we could well see major changes in top positions, at both the company and regional levels. We would like to thank our colleagues Martin Hecker, Kelly Howe, Massimo Russo, Daniel Küpper, Daniel Spindelndreier, Skye Whiteman, and Michael Zinser for their contributions to this report.